When you’re a parent, enjoying summer meadows seems like a lot of hard work when you have to think about how to get there and what to take with you, etc. However, if you follow our good advice, both parents and children can enjoy a great day out. Substitute the plastic toys for daisies, grass and trees as it’s vital that your child doesn’t lose contact with nature, especially during their early years. A picnic is ideal for this. This is where a baby can discover flowers, insects, plants and all nature’s riches. Even just spending time on the grass can be a real experience for a youngster. It’s especially important for your baby to go outdoors if you don’t have a garden at home and your child spends most of their time indoors. Give them the chance to learn about bees, flies, birds, ants and dogs and what they look like as well as what they do. Let your baby grab blades of grass and daisies and play with stones and branches. Even if they try to put these in their mouth, it has to be healthier than a plastic toy. Let your baby experience the smell of flowers and fields and the feeling of grass under their feet. If you go on picnics regularly, you need to have the right gear even if you don’t quite have the full range.It's worth investing in a good picnic blanket that has a waterproof cover underneath to protect you from cold and wet ground. 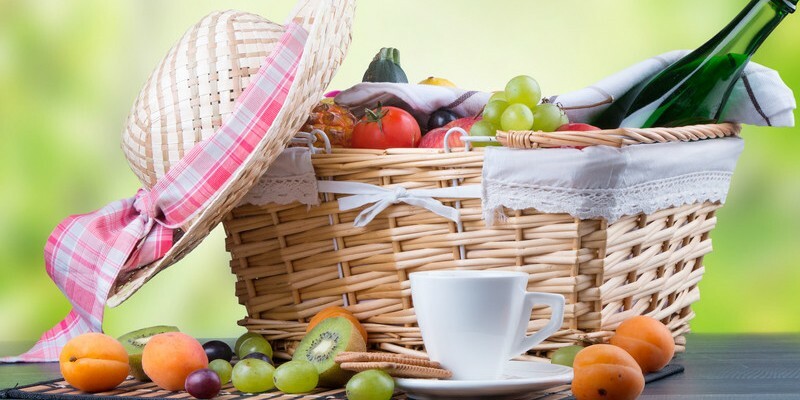 Also, think about taking baskets and other accessories specially designed to carry food for a picnic. Initially, a simple woollen or cotton blanket can be enough. If possible, take several so you have enough space and aren’t cramped together. Then, you can make the most of the open green spaces. Take baskets, bags and coolers. Take as many bags as you can carry to take everything in one go. If you can’t do this, put things in the pram or in a large rucksack. Also, take at least one cooler for food and drinks. Take reusable plastic plates, cutlery, tea towels and a couple of paper towels per person. In addition, take drinking water and water to rinse plates etc. or dirty hands. Don’t forget those small things that are very useful and easy to forget. These include a corkscrew, bottle opener, rubbish bag and torch. A torch is important in case it gets dark sooner than anticipated. As with any other trip to the countryside, don’t forget to take your sun block and a first aid kit containing dressings and disinfectant as a minimum. For babies, as well as taking nappies, take a good outdoor cover. Don’t forget soft toys, towels and spare clothes as well as a small hat in case you need it. In theory, you can take all your favourite dishes with you but, rather than launching into long food preparation that needs lots of ingredients, try to think in practical terms. If you want to pack cakes and pastries, steer clear of cream cakes. It’s better to take plain cakes, muffins or brownies, for example. It's also best when these are small and in individual portions so you don’t need to do anything as they’re ready to eat. Instead of taking sweets, take fresh fruit, including apples, bananas and bags of tangerines. You’ll need to wash and pack these and possibly cut them up in advance too. It’s easy to take things like strawberries, raisins and berries with you. Take vegetable batons rather than salads. Fresh vegetables are perfect for a picnic as they’re practical and healthy. Salads can be tricky if they need a sauce as you’ll need bowls and cutlery to avoid getting them all over you when eating. For children, it's far better to opt for vegetables cut into sticks like carrots, cucumbers and peppers. Don't forget those little saucy dips to dunk your vegetable sticks into, including guacamole, tzatziki or tomato sauce etc. Also, consider taking smaller vegetables as bite-sized snacks, such as cherry tomatoes or radish. The best food for picnics and days out is finger food. These are things like small meatballs, chicken wings, ready-made sandwiches, wraps, spring rolls, bite-size cakes and individual pastries. Children tend to love these. Keep your drinks cool such as water, fruit juice or iced tea. Your drinks need to stay chilled until you’re outdoors. A good way to do this is to add ice cubes and put your drinks into a special isothermal container. There are usually lots of families at public picnic areas so why don’t you make the most of this and meet and talk with other parents? You can share tips on family picnics and the lovely undiscovered places you go to in the local area. You could even go for a walk together and enjoy food and drink while the children are playing alongside. This is therapy for the soul and helps to ease the worries of everyday life, breathing new energy into your family friendships. A picnic is like a game, especially for little ones. If you have older children, it’s also the perfect opportunity to get them away from computers, phones, and brick walls. Play a game of badminton, football or volleyball. Try a card or board game for the whole family. Whether children play with each other or with the whole family, enjoying an outdoor group activity will be really good for them. Enjoy an outing, a good dose of fresh air, good food and lots of shared experiences. This is just what you need to get out and leave your daily routine behind.